God, sorority news is so racist these days, amirite? Every where you turn it’s ‘We don’t allow blacks’ or ‘Taco Tuesday doesn’t mean eat delicious food, it means dressing up like ethnic stereotypes!’ Ugh. At Cal State Fullerton, Alpha Delta Pi’s Zeta Alpha chapter threw a Taco Tuesday party and invited all of their ignorant friends. At the recruitment event, 90 percent of the ladies came in dressed to kill … which meant wearing “sarapes, sombreros” and even “gang costumes” according the Daily Titan. Good job girls, really, Californians like me are so proud of you right now. Now ADPi is being punished by the Fullerton administration and I’m sure there are many crying ladies confused about what they did wrong. “We have concluded that the women were responsible for the event, that it’s definitely grossly inappropriate, and we’ve awarded a list of sanctions that they have to complete,” said Tonantzin Oseguera, Dean of students. As a result, following an investigation from the dean of students’ division of student affairs, ADPi will face multiple sanctions, including a disciplinary probation that extends through Dec. 31, 2015. 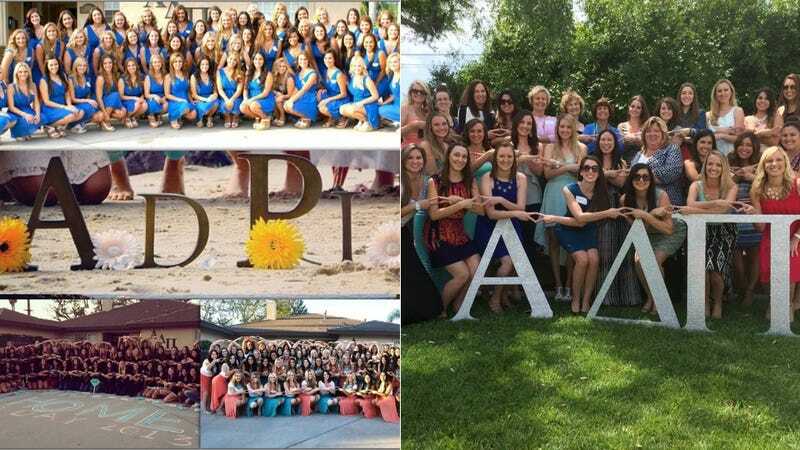 In addition, the ladies of ADPi must develop, attend and sponsor diversity workshops so they can teach their new members how to avoid another Taco Tuesday party. The sorors must create and promote a campaign similar to Ohio University’s “We’re a Culture, Not a Costume,” a collection of “posters of young people juxtaposed next to costumes portraying stereotypes of their ethnicity or culture, meant to combat cultural stigmas portrayed through costumes.” Fullerton hopes that by making these girls see that they're dressing up like someone's grandparents, parents, aunt or sister, minorities will finally become human beings they can acknowledge and respect. Here's to education! Oh, and when ADPi rush reopens in Spring 2015, the girls will be under surveillance in case they want to dress up like another ethnic group for fun.